The American Bugatti Club was founded in California in 1960 for the purpose of encouraging interest in Bugattis and providing a network in the United States for members to learn more about each other and their cars. The club encourages members to gather at events, share experiences and enjoy using their Bugattis in races, hill climbs, and rallies throughout the United States. A Register of all Bugattis known to exist in North America is maintained and published. Revisions are produced and printed each year in order to keep interested parties up to date. A quarterly magazine Pur Sang is published by the club for all members. 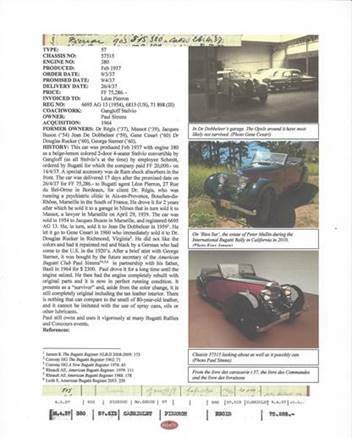 The club has just finished publishing the American Bugatti Register. 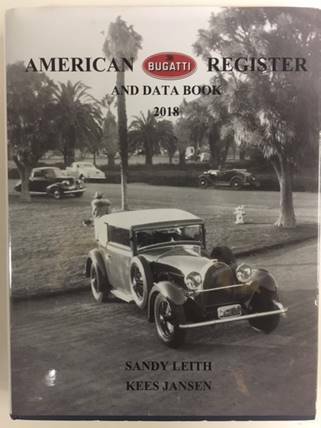 The 2018 American Bugatti Register and Data Book is now available. The Register will include all known Bugattis in the United States and will use a complete new format compared to the 2003 Register. This format has been adopted by other clubs and has much more information on each Bugatti as well as color photographs when available. It will devote one page to each car including factory sales and production information. An example is shown below. Cost $130 for members of a Bugatti Club and $145 for non-members. To order a copy, please contact Paul Simms at abcpcsimms@gmail.com or 630-469-4920. Although present or past ownership of a Bugatti is no longer a membership requirement, all applicants should be able to represent a real interest in the marque. A letter from an active member of the American Bugatti Club attesting to such interest must accompany each membership application. American Bugatti Club 2012 Calendar of Events - Click here for additional information. American Bugatti Club photos of events throughout the year. Click here to view.